If you happen to own an LG G3, you should keep an eye on the notifications panel. The LG G3 Android 5.0 Lollipop update is now being pushed to the European users. We don't know whether the update is available for all European countries, but we received it on our Vodafone G3 in Romania. 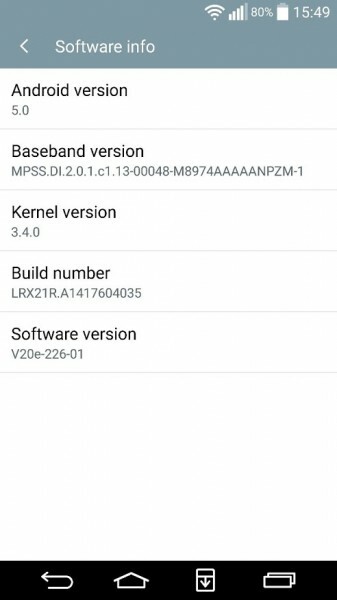 The Android 5.0 Lollipop update for LG G3 has build number LRX21R and has a size of about 520 MB. We are recommending you to download the update file using a stable WiFi network in order to avoid damaging your data plan. As usual, the LG G3 Android 5.0 Lollipop update is being rolled out in phases, which means that some of you might not be able to download and install the new firmware right away. Once your terminal becomes eligible to receive the update, you should be able to notice a system update message in the notifications bar. Tap on it, choose 'Download now', wait until the download is completed, then select 'Install now'. Your smartphone should reboot and install the new firmware. In case the system update notification hasn't arrived, you would also want to perform a manual check under Settings > General > About phone > Software update > Check now. Lollipop is no doubt the biggest update Google's mobile operating system has received since it's debut. It's even bigger than the jump from Gingerbread to Ice Cream Sandwich. The upgrade introduces a new design language called Material Design, lock screen notifications, multi-user support for phones, Smart Lock, batter battery statistics, ART instead of Dalvik runtime, revamped notifications bar and quick settings, and more. Are there any LG G3 owners among you? Have you guys received the new update? Please let us know in comments. Just got the update yesterday at Singapore. That is some lagging issues occur. This is my first update for Lollipop, hopefully the second update will fix it. Updated in Greece, seems smooth and the lag has gone, from friends who had this upgrade too i heard that it was with problems, i suppose they didnt mind to do a factory reset before, thats why they had problems, Battery life i cannot tell yet because it needs recalibration , maybe after 2-3 cycles i will know! There were 2 times lolipop update here in South Korea. It was fastest reaction than the others flagship model such as samsung even more than the Nexus 5 OTA. First time update lolipop about 2 weeks ago. Second time update was few days ago for bug fixes and application improvements. I really satisfied lolipop. Got this yesterday afternoon. Phone seems much zippier and battery life has increased dramatically... Looking great so far. Which network are you with mate? Do you mind just telling me what the software version/build number is? Have the LG G3 with Verizon Wireless as my carrier. I've been checking for this update every couple of hours, for a few weeks now. It's absolutely driving me crazy. You don't need to check. It automatically notifies you when it arrives. Me too! I'm dying for the update!